Why feed with complete fresh meat in addition to Farm Food HE? A healthy intestinal flora is one of the most important foundations for total health in your dog. If the intestinal flora is out of balance or too scarce, then health problems are guaranteed. Skin, coat, intestinal problems or allergies very often find their origins in a disturbance of the intestinal flora. It is for this reason that from the very start of our existence (and as the first), we advised to give fresh meat alongside our dry dog food, in order to optimise the intestinal flora. We often see diarrhoea and other intestinal problems (and not just amongst puppies) being caused by a poor intestinal flora. We talk about a poor intestinal flora if there are too few different bacteria colonies in the intestine. If this is the case then food is not sufficiently digested and rotting and fermentation occur in the large intestine. This causes diarrhoea and the dog finds itself in a vicious circle, and it is difficult to escape this without tackling it in a natural way. For this reason we advise the use of Farm Food Fresh Tripe and Heart Complete (based on green, unwashed/dirty, beef tripe) on so-called “fresh meat days”. Farm Food Fresh Tripe and Heart Complete contains all the necessary bacteria and enzymes for building up and maintaining healthy intestinal flora in your dog. As you will understand Farm Food Fresh should be defrosted and served raw at room temperature to produce the desired effects. Cooking, warming or defrosting in the microwave are very bad ideas because in that way all the bacteria and enzymes are destroyed. It is also important during and after every antibiotic treatment and intestinal infection to give your dog Farm Food Fresh Tripe and Heart Complete for a few days. The intestinal flora can then recover in a natural way. It is also important to give supplementary vitamin B complex during treatment with antibiotics and for up to 7 days afterwards. Instead of the Farm Food Fresh “fresh meat days” you can achieve the desired effect by giving a small amount of Farm Food Fresh Tripe and Heart Complete every day, mixed with the pellets. Our small sausages are ideal for this. 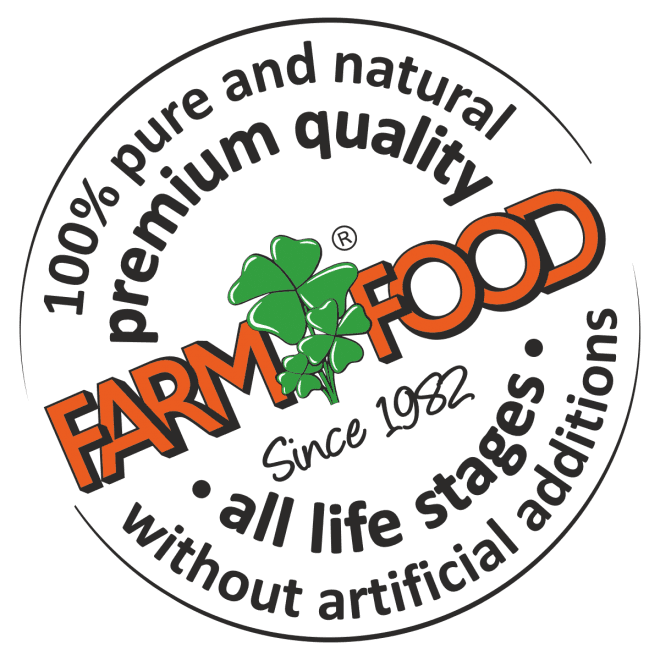 Farm Food Fresh Tripe and Heart Complete and Farm Food Fresh Beef Complete are naturally also extremely suitable as daily food for your dog; for this you can choose our larger containers or large sausages. 50 grams Farm Food HE is equivalent to approximately 100 gram Farm Food Fresh Tripe and Heart Complete. (Also read our extended article where we look in more detail at the issues surrounding intestinal flora).